Razer recently announced its new gaming laptop, Dubbed “Razer Blade”. A 14-inch ultraportable gaming laptop with strong performance, a QHD+ touch display, and also best-in-class compact design. The entire chassis is black machined aluminum, that looks attractive and feels luxurious. There are two muscle lines on the lid, with the lime green Razer logo centered in between. This new laptop is measures 0.7 × 13.6 b × 9.3 inches (H ×W ×D) and weighs 4.26 pounds, which is quite impressive for a laptop that can be play serious games. The new Razer Blade is equipped with the latest 6th generation Intel Core i7 quad-core processor and an NVIDIA GTX 970M graphics card with 6 gigabyte of VRAM. The screen looks sharp, gets plenty bright, and also boasts vibrant colors thanks to Indium Gallium Zinc Oxide (IGZO) technology. Connectivity options are versatile, you get two USB 3.0 ports, the power jack, and the audio jack. On the right side, there’s another USB 3.0 port, a USB-C with Thunderbolt 3 port, and an HDMI port. There’s also speedy dual-band 802.11ac wireless by Killer, Bluetooth 4.1, and a TPM 2.0 security chip. 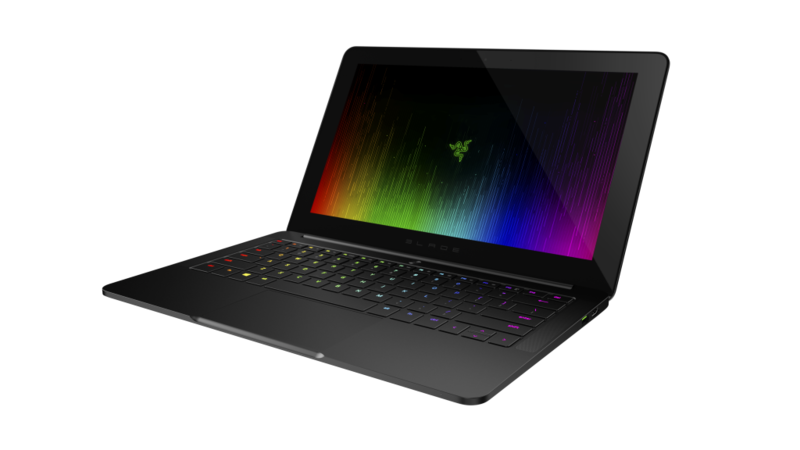 This 14-inch Blade is part of Razer’s Chroma line, which also covers standalone desktop keyboards, and offers more backlighting flexibility and features than any other laptop. In addition to making the keyboard into an interactive work of art, Razer’s Synapse software offers a bevy of features designed to help you play your best game. Razer claims the Blade will last up to 5 hours on a charge and starts at $1,999.